Oops! I missed the January edition with my article on New Year Resolutions. We will just skip over that topic. Anyway, how many of us keep to those resolutions? Umm..mostly, ummm…not me….hahaha. So, on with more exciting news from the Saturn Antenna team. This year, we will be celebrating 20 years! Woohoo! 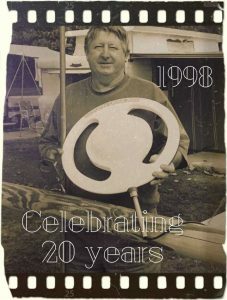 I can’t believe that it is 20 years since Peter designed the Saturn Antenna. In looking back, we have so many people to thank for our initial start. Peter’s design was tidied up with Tony Huxley’s knowledge of fibreglass and Brian Smith’s help to make a mould to make the antenna shells. Thanks guys. Also, our thanks go to Tony and Rosie Stewart (Rainbow Beach Houseboats) and Ros and Peter Reynes (Fraser Island Rent A Yacht) who purchased antennas that were outperforming existing marine TV antennas. They are still being used to this day. Very quickly this ‘marine’ antenna was snapped up by the caravan industry. Travellers realised Saturn Antennas was the easiest TV antenna to use because there was no need to change the way the antenna sat (vertically or horizontally). It had two aerials inside the shell to cater for all transmitters around Australia. The task of adding a booster and then pointing to the transmitter was also a thing of the past for the traveller. Peter had covered all those bases as well, with the multi-directional antenna having an in-built booster. In the beginning, we could make six antennas in a week. Now, we make 26 antennas in a week. The Saturn Antenna has moved from being sold only in Queensland to being stocked by all good caravan stores around Australia. Many times, we have been told to have it made overseas, but we have resisted all suggestions. We are committed to making a superior, Australian-Made TV antenna for the traveller. We want to keep industry local. To promote and sell the Saturn Antenna, we travel to caravan shows in every state, so we have seen a lot of this beautiful country. And this year is no exception. To give us an interest to travel the same roads, we choose a theme each year that makes us stop and ‘smell the roses’. Five years ago, we did a Pub Crawl and found some fascinating country pubs tucked away in little communities. Then came the Bakery Run, Aussie Bear adventures and the History Trail. We are getting ready to hit the road with Saturn Antennas. This year our theme for our travels is “The Retirement Trail”. Thanks Adrian and Trish Paterson for the idea. We look forward to telling you all about our travels. Till next month, stay happy and healthy and safe on our roads.